Pagan Galilee is mentioned in the prophet Isaiah (Isaiah 9: 2). By the time of Jesus Christ, the Galileans had an adverb from the inhabitants of Judea (Mark 14:70). Most of the apostles were Galileans (Acts 1:11). The main Galilean cities were Bethsaida (the birthplace of the Apostle Andrew, Peter and Philip - John 1:44), Canal of Galilee (Nathanael's birthplace - John 21: 2), and Nazareth (the birthplace of Jesus Christ - Matthew 2:23; :eleven). The Jews of Jesus Christ worshiped the Galilean (Matthew 26:69, John 7:41). According to Matthew, after the resurrection, both the angel and Jesus, sent the apostles to Galilee (Matthew 28: 7-16). In the era of the apostle Paul, there were churches in Galilee (Acts 9:31). On the way to Galilee is visited - Bethabara (Greek Βηθαβαρᾶ, Hebrew בית עברה - house of the crossing, place of the ford) - a place on the Jordan River, 10 kilometers north of the confluence of the Jordan River to the Dead Sea, where the ferry crossed the river . The place is associated in the Christian tradition with the Baptism of the Lord on the Jordan River, as well as with the crossing point of the sons of Israel, who crossed the Jordan together with Joshua, leaving an altar of 12 stones at the crossing site, according to the number of tribes of Israel, and then entered the promised land. 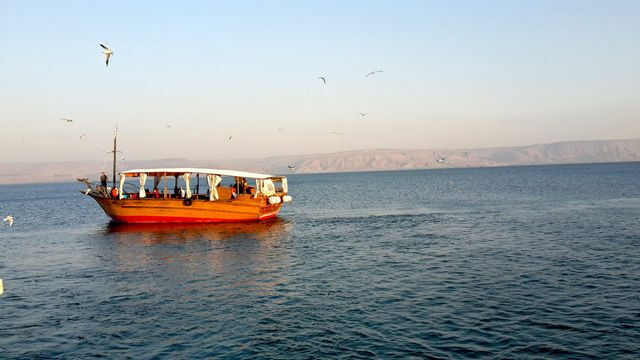 The Sea of ​​Galilee, known in ancient and modern Israel as the Sea of ​​Galilee (Hebrew ים כנרת, "Yam Kinneret", Arabic "Bukharat Tabaria", also the Sea of ​​Kinnerere or the Hinnerere, Sea of ​​Galilee, Genisareth Lake, Gennesaret Lake ) Is a freshwater lake in the northeast of Israel. The name Tiberias Lake received from the name of the city of Tiberias (modern Tver), founded in the 1st century AD. in honor of the Roman emperor Tiberius. The lake is repeatedly mentioned in the Bible in the books of the Old and New Testaments. In the Old Testament it is referred to as the "Sea of ​​Kinnerere" (Numbers 34:11 and others) or "the Sea of ​​Hinnereth" (Josh 12: 3, etc.) as the area through which the boundary of the land of Israel passes, and as "Hinnaroth" (Rev. 11: 2). The fortified city of Hinneret (Kinneret) is mentioned as being on the lands of the tribe of Naphtali (Josh 19:35). Mount of Beatitudes - a place opposite the western shore of Lake Galilee was named - Mount of Beatitudes. According to tradition, the Sermon on the Mount was pronounced here by Jesus Christ (Matthew 5). Now there is a vast territory of the Catholic monastery Carmelites with a temple built by the famous Italian architect Antonio Barluzzi.